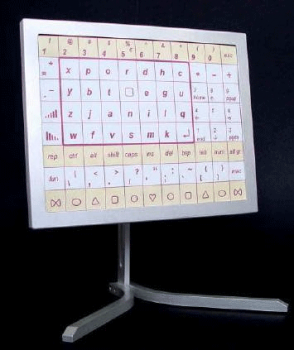 LUCY enables people who cannot handle an ordinary keyboard to use a personal computer. 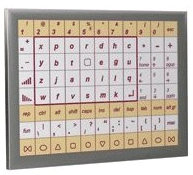 There are several control methods, such as laser, mouse, trackball and switch control. The output to the computer includes all possibilities of the normal keyboard and the mouse. 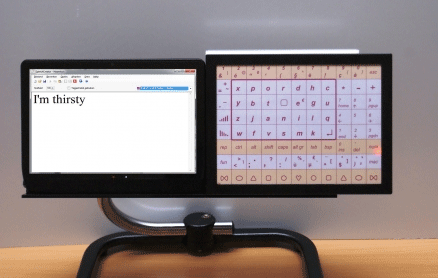 With laser control and head movements, experienced users can reach a sustained speed of more than 100 characters per minute for many hours a day. 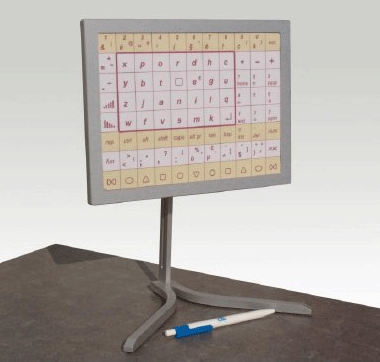 LUCY is available with an optimised character layout for the Dutch, English, French, German or Italian languages. The arrangement is easy to learn and much more efficient than the standard QWERTY or alphabetical layouts. 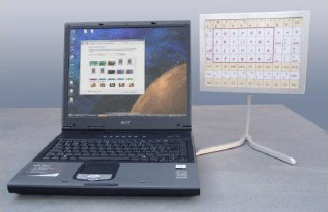 Output to the PC is via a single USB cable that provides keyboard, mouse, user data and power connections. LUCY also has a USB input connector for a mouse, trackball, touchpad or other device. Two switch input connectors and built-in LEDs enable the use of LUCY as a scanning device. LUCY is plug and play and does not need any special drivers. However, it comes with special Windows software to change various settings to suit personal preferences and provide on-screen feedback to the user. Panel size: 19x25 cm | 7.5" x 10"
Weight: 870 g | 1.92 lbs. 1 × USB-B for PC keyboard and mouse output. 1 × USB-A for mouse / trackball etc. input. 2 × 3.5 mm Mono Jack for switch input. Power supply: via USB connector. System requirements: All PCs, Windows version; Win 98se and later and Android tablets. Housing colours: black and silver-grey.